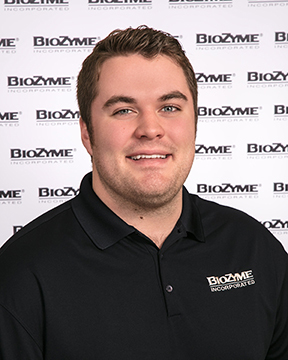 BioZyme® Hires Jack Oattes as Sales Manager in Canada, Northeast U.S.
Jack Oattes, a native of Ontario, Canada, has joined the BioZyme® Inc., staff as one of its newest team members. He will serve as an Area Sales Manager in New York and the Northeast United States, as well as represent the International Team in Canada. In his role, he will work to develop new and build upon current dealer and customer relations while promoting BioZyme’s many brands. “BioZyme is a leader in the field of animal nutrition. But it’s the great people and top-quality products that make it an exceptional organization,” Oattes said about returning to the company where he previously worked as a summer intern. Oattes grew up involved on his family’s purebred Charolais and Simmental operation in eastern Ontario, where they raise and market bulls and show cattle prospects. He attended college in the U.S., participating in successful livestock judging teams at Blinn Junior College and at Kansas State University, where he won high individual at the North American International Livestock Exposition. He earned his bachelor’s in animal science with an emphasis in business at K-State. He recently received his master’s in cow-calf nutrition and management from the University of Illinois where he also helped coach the livestock judging team. In addition to representing BioZyme and its brands in the northeast U.S., Oattes will be working to promote the products and work with dealers in Canada. “We are happy that Jack joins us to give even better support to our exclusive distributor in Canada, DCL. The efforts we are putting into Canada with Dr. Fernando Bargo and Jack will be fruitful to untap the potential of BioZyme in this market,” said Volker Altenbokum, Director of International Business Development. Oattes will be located in Cobden, Ontario, Canada. BioZyme is known for its supplement brands VitaFerm®, Sure Champ®, Vita Charge®, DuraFerm® and Vitalize®. The company also manufactures and markets Amaferm®, the key additive in all its supplements. For a list of BioZyme Area Sales Managers, visit http://biozymeinc.com/our-staff.